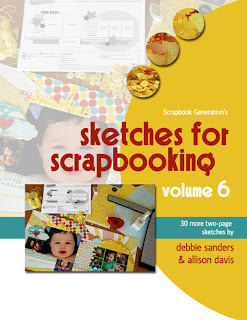 Scrapbook Generation sketches make scrapbooking a breeze! Don't spend precious time moving pieces of paper around on the page. 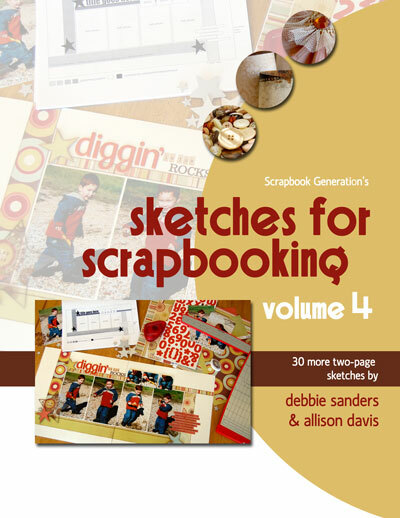 Let Scrapbook Generation sketches do all the heavy lifting, while you have all the fun. • No more guesswork! The sketches supply exact measurements for every strip of paper and every photo. They even tell you exactly where to place items on the page. • No more wasted time! 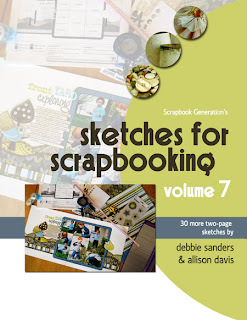 Spend your scrapbooking moments doing the fun part: selecting photos and papers, choosing and creating embellishments, and journaling special memories. 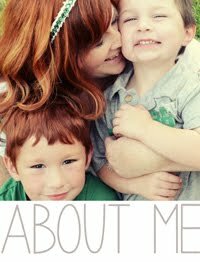 • No more stressing over page design! 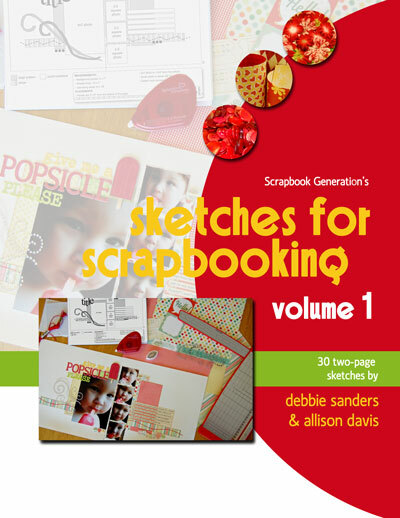 Our sketches were created from actual layouts by two talented designers who believe that your photos should always be the star of the page. Visit the publication section of the SG online store to order any of the following books! Sketch Fusion with Simple Stories showcases 24 fun and functional sketches, along with 24 beautiful full-color layout examples created by Allison Davis and Debbie Sanders. With exact measurements and positions of photos, papers and elements, Sketch Fusion is a must-have resource for anyone who loves the Simple Stories format. 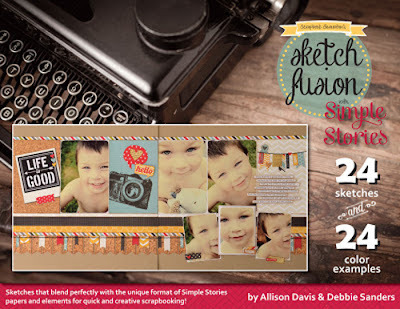 You can order Sketch Fusion with Simple Stories by clicking here. 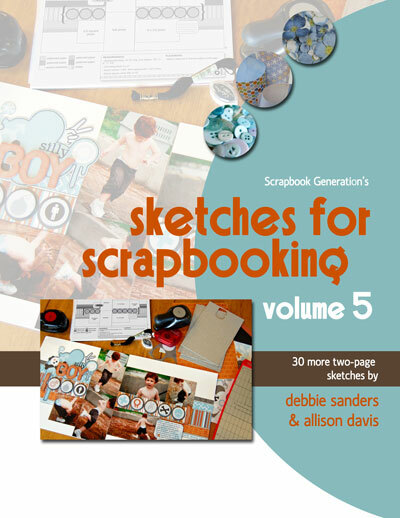 Sketches For Scrapbooking by creative-duo Debbie Sanders and Allison Davis. 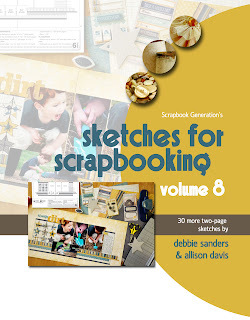 Each of the eight volumes contains 30 sketches of double-page layouts with exact measurements and positions of photos and papers. You can order Volume 1 by clicking here. 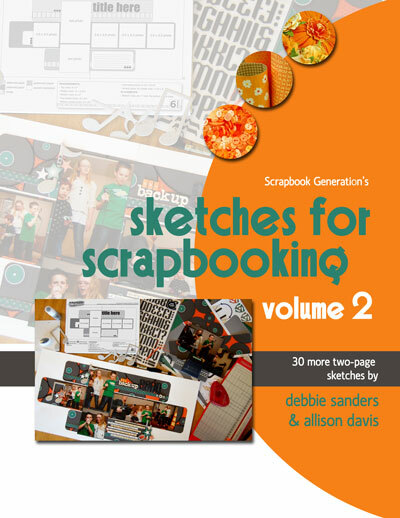 You can order Volume 2 by clicking here. 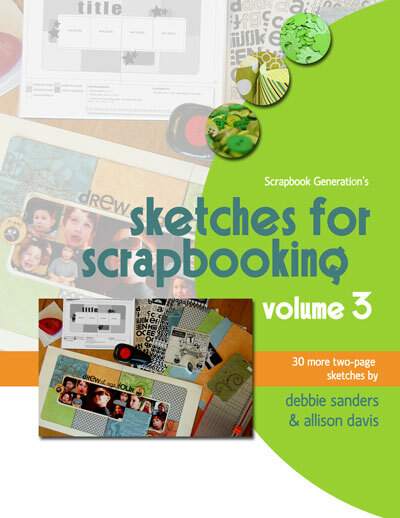 You can order Volume 3 by clicking here. You can order Volume 4 by clicking here. You can order Volume 5 by clicking here. You can order Volume 6 by clicking here. You can order Volume 7 by clicking here. You can order Volume 8 by clicking here. Sketches for Scrapbooking: Travel Sketches is our first themed sketch book. This new volume contains 30 exclusive sketches designed by Debbie Sanders and Allison Davis, and also contains photography and journaling tips to help you get that travel album together in a flash! What makes SG sketches so unique? 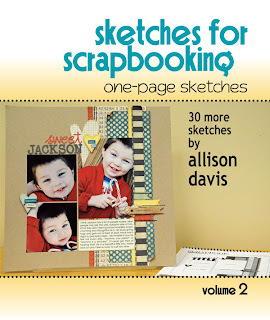 Our sketches have a key that indicates which areas are stripes, small patterns, large patterns, contrasting cardstock, etc., and all page elements have exact measurements! 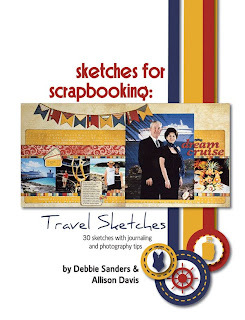 You can order Travel Sketches by clicking here. One-Page Sketches For Scrapbooking by Allison Davis. 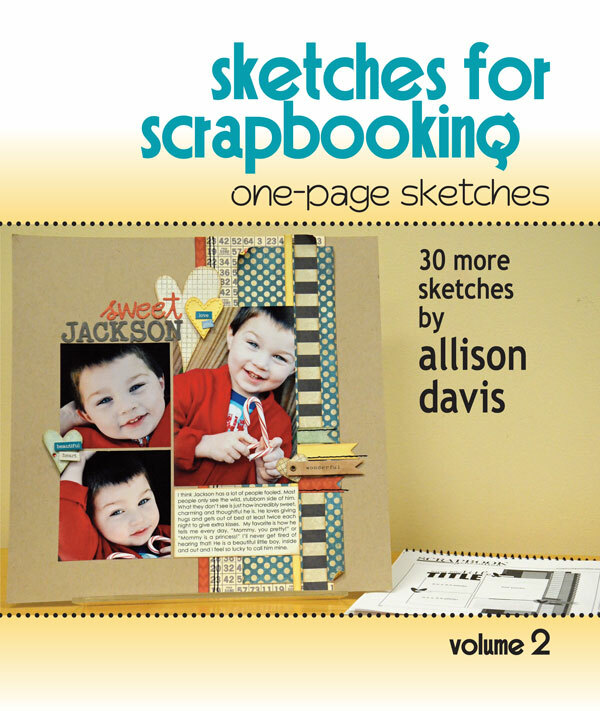 Each of the two volumes contains 30 sketches of one-page layouts with exact measurements and positions of photos and papers. 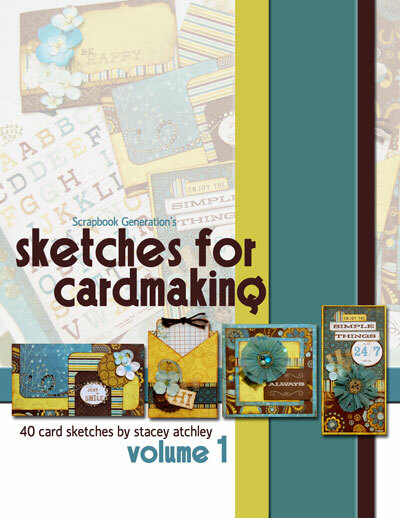 Sketches For Cardmaking by Stacey Atchley. 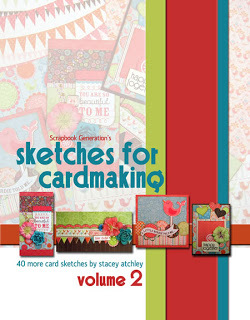 There are two volumes of Sketches For Cardmaking. Each is packed with 40 detailed card sketches. 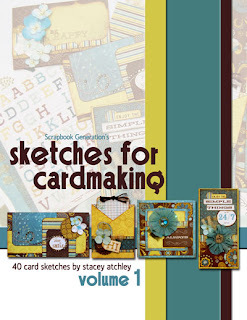 The books includes exact measurements of card bases and paper accents, and offer easy tips on how to vary both the size of each card and the embellishments. 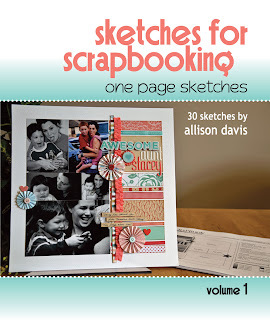 I bought your Sketches for scrapbooking one-page sketches vol 2 this weekend at a crop...and completed 17 pages using it!! I LOVE that you include measurements for all elements!! Thank you!